Near Mint Original Condition - except for (possibly) beautiful replacement back glass - feel it is in excellent condition. All new bumpers, and reconditioned top to bottom. One of the Nursery Rhyme Series of the Gottlieb Nursery Rhyme Pinballs. This is said to be the first pinball machine manufactured with electromechanical flippers. This was new compared to the bagatelle game machines - this pinball has 6 flippers or flipper bumpers as referred to by Gottlieb, these flippers are placed at the bottom of the machine near the outhole and face outward instead of inward like modern machines. This Humpty Dumpty machine is constructed with wood and has backlit scoring - the scoring is preset instead of modern LED scoring. 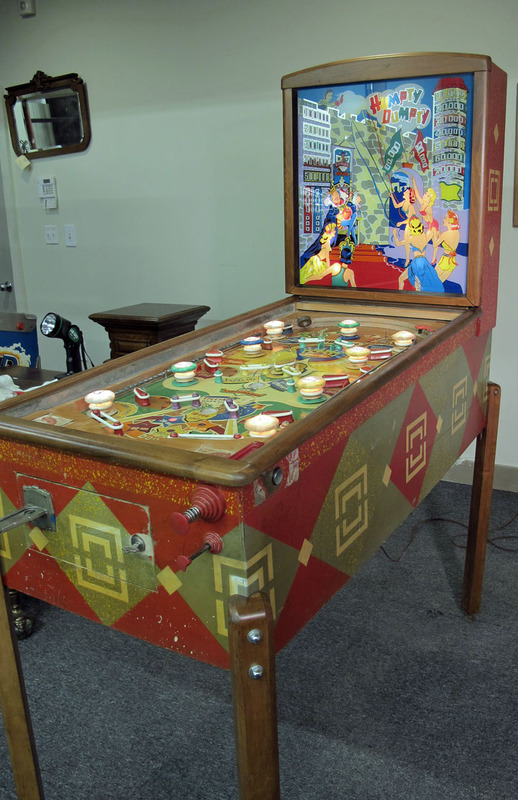 Humpty Dumpty is the first pinball machine manufactured with flippers that were electromechanical - most games were manually operated flippers such as bats on baseball games. David Gotlieb wanted to name this game 'flipper' - but a legal check found that name was already in use. Harry Mabs - a Gotlieb employee is credited with inventing the electromechanical flipper. Their marketing slogan was "announcing sensationally new player controlled flipper bumpers. The Player will Laugh! The Spectator will Roar! The Operator will be Thrilled!